With his wirerim glasses, bushy mustache and graying hair, Jacky Blot might well look his 65 years of age in those photographs featured in wine magazines, but anyone who has bounced with him in a four-wheel drive vehicle through the vineyards would hardly think he was a day older than 21. He oozes a crazy energy in everything he does. Given their vibrancy, his wines must listen. In spite of his age, he is—with younger pioneers like Roman Guiberteau in Saumur and Eric Morgat in Savennières—the new face of chenin blanc. For most tourists, the gentle stretch of the Loire that flows from Tours to Angers conjures visions of castles, stately manor homes and lazy afternoons on a bicycle tour along one of the river’s many tributaries. For many British, it is their first port of call when they cross the English Channel into France. After all, their first kings hailed from this region. Not surprisingly, the wines from the Loire figure far more prominently in that market than they do in the United States. While the douceur angevine, as the French call this gentle countryside with its “sweet” air, may be perfect for a summer holiday, few associate the region with serious vinous pleasures. Older readers will, of course, remember when Muscadet was in fashion as a refreshing white wine to drink with oysters, but few connoisseurs would mention chenin blanc in the same breath with chardonnay, sauvignon blanc or riesling. That is a mistake! Few grapes are so versatile and, as a new generation of winemakers is proving, the finest examples can compete with anything those other varieties have to offer. In fact, a number of these wines must now be counted among the finest whites produced in France. In some ways, chenin blanc being banned to purgatory—as Jean-Pierre Chevallier of Château de Villeneuve described the difficult era in the early 1960s when much of the “Côte des Blancs” in Saumur was replanted with cabernet franc—most likely has something to do with its similarity to riesling. Indeed, some call it the French riesling, but Philippe Foreau in Vouvray disagrees: “Riesling is the German chenin blanc,” he asserts. Both varieties are slightly aromatic, have brisk acidity and excel in a fascinating number of disciplines. Each makes fine sparkling wines at the cusp of ripenesss, but also bring forth stunning dry, off-dry (which the French now often call tendre) and even noble late-harvest nectars. Chardonnay and sauvignon blanc, on the other hand, are not quite so versatile, however well they may be used. Multiple talents, though, create confusion in consumers’ minds, which any marketing guru will tell you can be a handicap. The success of their sparkling wines, whether they hail from Vouvray, Saumur or Anjou, has also led to the widespread introduction of genetic material planted to deliver the much larger yields allowed by law for Crémant de Loire. This clone, disparagingly known as “a bulles” (meaning “for bubbles”), may be well adapted for that purpose, but it can not be reconverted to the production of dry whites, at least not if quality is to be part of the equation. Not surprisingly, chenin blanc runs the gamut from sublime to barely pedestrian. Chenin blanc’s pedigree. Sometimes called pineau de loire, or even blanc de Brézé, chenin blanc probably had its origin in the region of Anjou. In his classical rant, Gargantua, Rabelais praised the grape as early as 1534. Accoring to Dr. José Vouillamoz, the renowned Swiss geneticist, one of its parents is probably savagnin (or traminer) and it is either the brother or sister of both sauvignon blanc and trousseau. More surprising is the fact that its genetic profile is identical to that of godello, the Spanish variety found in Galicia. Other than in South Africa, where it was taken by French Huguenots who fled from Saumur to Cape Town via Amsterdam after the Edict of Nantes, chenin blanc is found princiapally on the middle stretches of the Loire where the vegetative cycles are fairly long. It would not ripen in Sancerre. Even in Saumur, the geographical center of production, it flowers irregularly, which often makes it necessary to do three or four flushes through a single vineyard in order to harvest only ripe grapes. A generation ago it was so difficult to sell chenin blanc that many producers grubbed up some of their finest vineyards in order to plant cabernet sauvignon or cabernet franc. While that is understandable from a financial point of view, it has also created even further confusion, with regions like Anjou suffering from a clear lack of identity. Saumur, for example, can be hyphenated as Saumur-Champigny, Saumur-Puy-Notre-Dame, Cabernet de Saumur Rouge or Rosé, Crémant de Saumur Rosé or Blanc, Saumur Blanc and even Coteaux-de-Saumur for noble late-harvest interpretations. Further, for those who want to push their yields beyond the respective limits of the above appellations, all wines here can be declassified to Crémant-de-Loire, Anjou Rouge or Blanc and Rosé d’Anjou. The last of these alone—a bland, off-dry plonk—now accounts for half of the total production in Anjou, a larger appellation of which Saumur is only a part. Dry Anjou Blanc, once the pride of the region, but which, much to the consternation of serious producers, must by law contain only 80% chenin blanc, has fallen to only 5% of volume. It is not surprising that a unique appellation like Chablis creates a clearer image in the consumer’s mind. Loire Blanche and Noire. While chenin blanc thrives both in what the French call the Loire blanche (chalk) and the Loire noire (schist), these two regions bring forth styles that are so different that it would be difficult in a blind tasting to imagine that they came from the same grape. Savennières, for example, is firmly on the black (noire) side of things, which is the schist of the Armorican massif of Brittany. White Anjou’s bedrock, like that of Touraine, is a bit more nuanced, with two geological eras of tuff, Senonian and Turonian, engendering slightly different styles, further differentiated by the different types of shallow topsoil (alluvial gravel, flinty clay, sand or a mixture of the three). 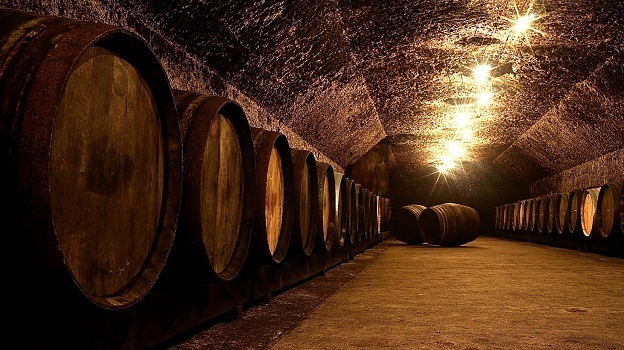 Long quarried for stone to build the châteaux of the Loire and their surrounding villages, the underground galleries now have a newer role as cool, humid places to crush and mature wine. Eric Morgat, one of the leading producers in Savennières, emphasizes how the black Anjou soil is acidic and poor in nutrients, and with no water reserve for the vines, making hydric stress frequent despite a high level of humidity. With only 150 hectares of vineyard, it is—with its twins Roche aux Moines and Coulée de Serrant—one of the smallest and most prestigious of the appellations in Anjou. “We have barely half the rainfall of Burgundy,” he says. “It is as if the vines had their roots in Roussillon, which has a similar metamorphic soil, and their leaves in Brittany.” Not a cakewalk by any means. Although the wines were once more off-dry in style, a new generation of winemakers has tried to render the chenin blancs from this region more Burgundian in character in order to make them more attractive to a wider public. Their work has three main prongs: higher maturity at harvest, use of barrel aging and malolatic conversions. Each of these changes is in and of itself at best a step in the right direction but have often been pushed too far, resulting in wines with high alcohol levels, excessive wood and lack of precision, whether due to botrytis or malolactic haziness. Ripe chenin blanc has thick skin, a quite tannic structure and can quickly fall prey to both higher alcoholic levels and botrytis. Juggling the need for total ripeness without losing control is complicated. At 12% his wines would be “totally vegetal,” explains Eric Morgat, “while at 14% they’re perfectly balanced.” Further east, on chalky soils, few producers would want more than 13% and ever more are trying to find just the right balance at much lower levels. While I basically agree with both Michel Bettane and Nady Foucault on botrytis, I take a slightly more nuanced approach to malolactic conversions. Yes, I generally prefer the brisk, clean purity of the chenin blancs from François Chidaine, Philippe Foreau or Arnaud Lambert, but a subtle handling of malolactics may well be a “necessary evil” on schist soils. As Patrick Baudoin explains, his take place naturally, perhaps because most of the chenin blanc at his estate is matured in barns that are near ground level. “I do nothing,” he says. “They either happen or they do not.” On the chalky soils further east, the pHs are lower and the cellars both cooler and more humid. Under such conditions, malolactics are rare. Biodynamic biodiversity. Another unifying element among the better producers of chenin blanc is their belief in organic if not outright biodynamic viticulture. Almost nowhere in France, or for that matter elsewhere, will you find so many members of Demeter, Biodyvin or Renaissance des Appellations. While Nicolas Joly of Clos de la Coulée de Serrant was the first to call wider attention to Rudolf Steiner’s philosophy, many of his younger accolytes, like Thierry Germain at Domaine des Roches Neuves, are pushing the boundaries even farther, creating nurseries for the massale selection of their vines, reintroducing horses to till their vineyards, and setting aside space for hedges, herbs and other crops in order to propagate biodiversity. The most well-known appellation for chenin blanc is certainly Vouvray, with it 2,200 hectares of vineyards spread out over seven villages on the north bank of the Loire just east of Tours. As another 600 lie fallow and a single hectare of vines costs only about 40,000 Euros, it is clear that even its reputation is only a shadow of its former self. While Vouvray has long had a tradition of off-dry wines, 80% of the current production is sparkling. All of that and more is harvested by machine, hardly conducive for making finer wines, but an ever-larger number of smaller estates is following the lead of two iconic producers, Foreau and Huet, in cutting out a niche for dry chenin blanc and noble late-harvest moelleux when the weather permits. However, not only have the past two vintages been very difficult due to both frost and hail, with yields down by as much as half each year, botrytis has not really been widespread here since 1997. Recent vintages in the Central Loire. Two thousand eleven, which is the vintage of chenin blanc that you are most likely to see on the market today, was a very precocious year, with crush beginning earlier even than in 2003. However, weather conditions at harvest were less than perfect, making it difficult for producers to coax the last drop of quality out of their grapes. While many consumers will prefer the more luscious style of 2011 or 2009, I generally give the 2012s the highest marks amoung the past three vintages. Not only have the producers moved from strength to strength, but 2012 has, like 2010 before it, the crisp fruit, inner depth and razor-sharp acidity of a great vintage. Unfortunately, there was not much of it. Montlouis, which is just on the other side of the river on a triangle of land where the Cher flows into the Loire, was until 1937 also part of Vouvray. With only 450 hectares of vineyards, it is much smaller but growing, up from only 300 a generation ago. A young active appellation led by the likes of François Chidaine and Jacky Blot from Domaine La Taille aux Loups, it has a higher general level of quality. The grapes here normally ripen five or six days earlier than in Vouvray. That, combined with the slighty higher proportions of silex in the soils, makes it more difficult for botrytis to develop, but gives the dry chenin blancs the clarity of cool water from a mountain stream. Given the grape’s character, Xavier Weisskopf of Domaine Rocher aux Violettes in Montlouis believes that it is important to distinguish between the components of the variety and the minerality of the soils, arguing that this can be done while tasting. If the vivacity is on the front of the palate, it’s the acidity of chenin blanc; if it’s at the back, that’s minerality. Chenin blanc’s sweet spot. 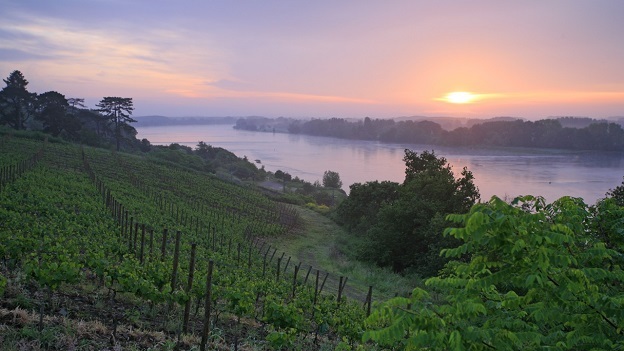 Very few of the vineyards on the Loire actually rise above the river, such as those that we know on the Rhône in southern France, the Adige in northern Italy or the Rhine in Germany. Most of them are on the plateaus above the Loire, both to the north and south of the river. In their rolling hills, the south-facing slopes of those outcrops with limestone bedrock are the most propitious locations for vines. Chinon is one of the exceptions, but few of the white wines produced there beyond those of Bernard Baudry and Philippe Alliet are truly worthy of note. For dry chenin blanc, Savennières is the other, but Coteaux du Layon have traditionally been even more famous. Scattered over some 1,500 hectares, the vineyards on the Layon, a tributary of the Loire near Angers, are favorably exposed on well-ventilated slopes of brownish schist and sandstone. Everywhere here you see castles, manor homes and legions of walls that testify to a forgotten era when these wines were as prestigious as those of Sauternes, when producers earned money with their noble late-harvest chenin blancs. Both Sylvain Brault, the president of the producers’ association in Coteaux de l’Aubance, and Claude Papin, president of the same body in Quarts de Chaume, speak of the “black hole” into which their appellations had fallen in the second half of the 20th century, emerging only with the fine vintages of 1989 and 1990. Making a living from sweet wine alone, despite its attraction, is nearly impossible—and, due to the morning fogs that encourage the formation of botrytis, making dry wines here remains extremely demanding in most years. The twin hearts of this region are Bonnezeaux, with its less than 90 hectares of vineyards, and Quarts de Chaume, with 50. The latter was upgraded to grand cru status in 2010. Even today, Claude Papin from Domaine Pierre-Bise, the leading estate in the Quarts de Chaume, admits that it is difficult to command the prices necessary to justify the work needed to make great dessert wines. Similarly, the fact that Château de Fesles, the doyen of Bonnezeaux, has been sold several times over the past decade speaks volumes. Part of that problem, though, may be self-inflicted. While the laws demand that a Coteaux du Layon have a potential alcohol of at least 11.5% at harvest, that is only a fraction of the ripeness necessary to make a vendange tardive in Alsace. That you are allowed to chaptalize a wine sold to a gullible public as a noble late-harvest is counterintuitive. Many estates, though, take advantage of that option, also allowed elsewhere on the Loire, because yields are higher and the risks associated with late harvests significantly reduced. On the whole, though, the Loire appears to be on a mild upswing. While total exports of French wine fell by 7% in the first half of 2014, producers from the Loire fared much better. Their shipments were up by 3% in volume and 8% in value. Sales in two major export markets, the United States and Great Britain, grew even faster, up 10% and 11% respectively. Yes, much of this can be put down to Muscadet, Sauvignon de Touraine and Rosé d’Anjou, but chenin blanc has also put its best foot forward, albeit from a much smaller base. The wines for this article were tasted either at the some 30 estates I visited on the Loire from late August through the harvest in early October, in my office on the Rhine, or at various sessions with sommeliers in Paris.